Bell Star Motorcycle Helmet Medium M. The latest, extremely aggressive generation of a helmet that started a safety revolution in motorsports, the Bell Star Helmet has been reborn to serve the two wheeled masses with even greater performance and protection. Redesigned with a smaller profile for a more refined fit and tuned specifically for the upright riding position, the Bell Star combines the comfort and riding characteristics of a touring helmet with race-bred aerodynamics and performance. STREETVIEW: The Star features two unique profile shapes for two distinctly different types of riding. The Raceview profile used on the Pro Star and Race Star uses an orientation specifically optimized for a tucked, more compact position. Conversely, the Streetview profile used for the Star is designed for a more upright, sport or touring position. PANOVISION VIEWPORT: No matter what or how you ride, one factor remains constant: the need for maximum visibility. Whether racing or going on a simple ride in the mountains, the ability to make safe headchecks and see obstacles clearly is critical. The Panovision viewport in the Star offers riders additional vertical and lateral visibility over the previous Star and more traditional viewports. This allows the rider to see better in a tight or tucked position and make saferlane changes and head-checks. EYEWEAR COMPATIBLE: Using prescription glasses or a preferred pair of shades is now possible with eyewear arm pockets woven right into the interior liner. X-STATIC LINER: A leader in antimicrobial fabric technology, X-Static material is clinically-proven to provide bacteria and odor protection throughout the life of the liner. X-Static fibers are permanently bonded with a layer of 99.9% pure metallic silver. This silver layer is the key to X-Statics powerful antimicrobial properties, as it creates an ionic shield that permanently inhibits the growth of bacteria and fungi. Fabrics made with X-Static fibers are flexible, with the natural look and feel of traditional textiles, while offering all the benefits of pure silver. TRI-MATRIX COMPOSITE SHELL: A proprietary mix of Aramid, carbon fiber, and fiberglass delivers all the strength of carbon fiber in a more budget-protecting package. Woven synthetic fibers have long been proven to be some of the most practical solutions where lightweight strength is required. Bell's Tri-Matrix shell utilizes the combined power and superior characteristics of these race-proven synthetics, offering unmatched strength and durability. 6 EPS and 5 shell sizes. Meets or exceeds Snell M2015 and DOT certifications. Kickstart Motorcycles are a franchised motorcycle dealership for Norton, MV Agusta, Aprilia, Piaggio, Vespa and Lexmoto, we are also suppliers of helmets and clothing from Alpinestars, Shoei, HJC, Bell, LS2, Armr, Fly and many more. We can also supply genuine parts and accessories for all of your motorcycling needs. All items come fully invoiced. You also have the reassurance of dealing with an established dealer with a trusted reputation built up through honesty & integrity since 1976. Customers can also pay with cash on collection. 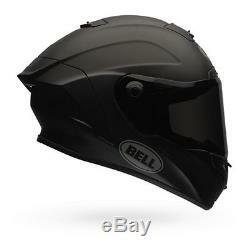 The item "BELL STAR MOTORCYCLE ROAD/RACE HELMET SOLID MATTE BLACK MEDIUM M" is in sale since Monday, February 20, 2017. This item is in the category "Vehicle Parts & Accessories\Clothing, Helmets & Protection\Helmets & Headwear\Helmets". The seller is "kickstartmotorcycles_established1976" and is located in Port Talbot. This item can be shipped to United Kingdom, Austria, Belgium, Cyprus, Denmark, Finland, France, Germany, Hungary, Ireland, Italy, Malta, Netherlands, Poland, Portugal, Spain, Canada, New Zealand, Norway, Switzerland, Sweden, Australia.